Settled in 1668 mainly by Dutch and English farmers, Leonia is one of the oldest communities in Bergen County and New Jersey. This town is rich in the arts and education, all thanks to its close proximity to New York City, various theaters and performing venues. 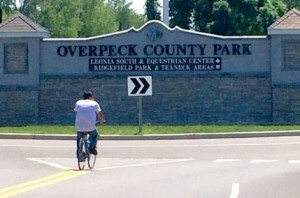 Leonia features five public recreational areas: Wood Park, Sylvan Park, the Leonia Swim Club, the Recreational Center, and Overpeck County Park. Leonia is also home to the oldest continuing theatre troupe in New Jersey, the Players Guild of Leonia, as well as the Summerstage at Leonia a Broadway-esque program during the last two weeks of July. The Leonia Chamber Musicians Society, comprised of local musicians, also performs four times a year throughout the town. Looking for a bite to eat? Try the Fontana di Trevi for great Italian fare and homemade desserts! Children in Leonia attend Anna C. Scott Elementary School from pre-kindergarten to fifth grade. From sixth to eighth grade, students attend Leonia Middle School, and for grades ninth through twelfth, Leonia High School. Students are also eligible to attend vocational magnet schools in Bergen County, including Bergen County Academies in Hackensack and Bergen Technical High School in Teterboro or Paramus. Bus service is provided by New Jersey Transit, Rockland Coach, and Coach USA to The Port Authority Bus Terminal.